At the current rate that the earths magnetic field is decaying, calculating backward over 10,000 years ago the earths magnetic field would have been so eminence that life could not have been sustained on the earth. Long term magnetic reversals, which many use as misinterpreted data, go against real geologic evidence, and still don’t offer a solution to the problem. 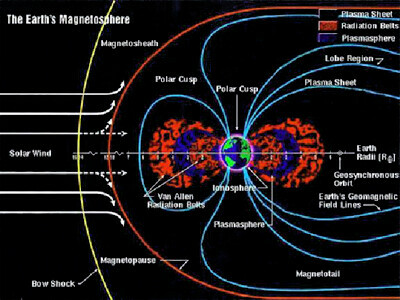 The Earths magnetic field serves as shield from the suns solar radiation, without which life would literally vaporize off the planet. On the other hand, if the earths magnetic field was too strong, it would also make life on the Earth impossible due to the heat that would be produced. A steady decay of the earths magnetic field has been measured for over 140 years. The current measure of the Earths magnetic field is 3.12e-5 Tesla (or 3.12 Micro Tesla), with a decay of 26 nano Teslas per year. Data collected shows the earths magnetic field decays at a calculated rate of approx. 5% loss to its total strength every 100 years. Calculating backwards, that would mean that 1450 years ago, the total strength of the earths magnetic field would have been roughly twice its current strength. Roughly 3000 years ago it would have been 4x its current strength. Using this calculation for the current decay rate, simply going back 10,000 years the Earth’s magnetic field would have been 128x stronger than it is today. This would have caused so much heat that the Earth would have been unsustainable for life. Also based on the same calculations, roughly in a few thousand years there will be no magnetic field to support life on the earth. Throughout the world, including the ridge of the Atlantic Ocean, scientists have observed differential magnetic rock formations embedded in solidified lava. These magnetic rock formations come from lava that has move up from below the surface of the earth, solidifying in the cooler temperatures, and had its high iron content arranged in accordance with the earths magnetic field (either ‘pointing’ north or south, essentially). This is a typical chart of what is found in this area, revealing a theoretical ‘record’ of when the reversals took place. Uniformitarianists assume dates according to current lava flow in each area. Uniformitarians and Evolutionists need to account for the rapid decay of the earths magnetic field and how it has remain intact for billions of years. They have thus come up with the magnetic field regeneration theory, which states that every time the earths magnetic field reverses, it also regenerates. In reality the data reflects that the earth magnetic fields during these reversals only continued to decay, rather than regenerate. This theory is not only improbably it is experimentally unsound, as a magnetic field could not regenerate any previous amount of strength simply by reversing. A major problem for old-earth believers is in regard to the timing of the earths last magnetic reversal. Uniformitarianists would place this at about 780,000 years ago. However at its current decay rate only 10,000 years ago the earth would have been so hot life could not have existed. Even if we assume a slower decay rate in the past, we cannot go significantly much past 50,000 years without running into problems. This indicates that radiometric dating that confirm an old earth date are incorrect as well. Not to mention according to the Uniformitarianists interpretation of the data, there would be a period during the Cretaceous Era in which there was no reversal for over 30 million years *between 85 – 115 Mya)! Recent scientific discoveries may show that the magnetic reversals happened very quickly, and could have been caused by a cataclysmic precession of events as suggested in Noah’s flood. The earth would had to have reversed a number of times to produce the amount of tectonic movement necessary to caused a world wide flood. Researchers that have studied the phenomenon and examined the lava flow have found that in certain magnetic crystals ‘records’ the reversals happened in a manner of a few days, not thousands of years! Evidence found by Geophysical Research Letters have found additional evidence of rapid reversals. This evidence is found from a completely different lava flow and the analysis reveals a time frame of only a few years. The time taken for each different rock formation strip to be magnetically orientated could have also been dramatically increases as lava would have been flowing out of each of these locations at a very high rate. This could be the misinterpretation of the time rates thus seen in the data of Uniformitarians.